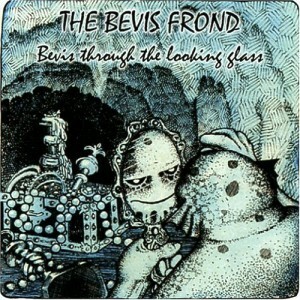 The Bevis Frond - "Bevis Through the Looking Glass"
I've read that this "outtake" album is just for diehard Bevis Frond fans, and not the place to start. Well, besides the odd track on a compilation, I was honestly not that familiar with Nick Saloman's music, so this is pretty much where I'm starting. Now maybe it's just my peculiar musical tastes, or I just have no idea what I've been missing, but I thoroughly enjoyed Bevis Through the Looking Glass, and as far as I'm concerned, it's as good a place as any to start. This album began as a limited edition double LP with a homemade cover when it was originally released in 1987, and continued life with a second less limited vinyl run. For those who may have been waiting for it, it's now finally been re-issued on a single CD, with new liner notes by Nick himself included. There's a bit of everything on Bevis Through the Looking Glass, from the shorter psychedelic pop tracks like the blistering rockers Die is Cast and the sludgy Mudman to the wonderful and luminous Now You Know and the mellow and quite catchy In Another Year. There are also some instrumental excursions like the soaring and beautiful Song For the Sky and the cheese organ driven psychedelic freakout of Soot. Also included is a song that Nick's mum recorded in 1967 of Nick when he was just 14, playing his own Arnold Lane inspired tune, a wonderfully English and whimsically psychedelic lo-fi romp called Alistair Jones. But if all that isn't enough, the set also includes two epic length freakouts, the nearly 14-minute long 1970 Home Improvements and the 19 ½-minute The Shrine. The former begins with a few minutes of free form noise before breaking into a heavy "improvised" jam with guitar, bass, drums, and some great, cheesy organ (Saloman plays everything on it himself). It's a great mind-melter, based on a chord progression from an old Stooges song. The Shrine, on the other hand, is an epic and moody psychedelic journey with blissed-out wailing vocals, weird panning spoken word bits, and dreamy, strangely distorted meandering instrumental sections. Contrary to what some other critics have said, I think Bevis Through the Looking Glass is the perfect place to start with Bevis Frond, because it takes us back to the early home-recording days, back to the heart and soul of Nick Saloman's music. For more info, visit the Bevis Frond web site at: http://www.woronzow.co.uk/bevis.html. Visit the Rubric Records web site at: http://www.rubricrecords.com.